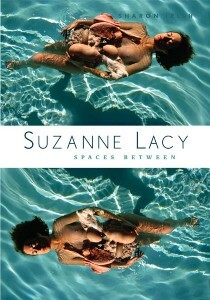 Suzanne Lacy: Spaces Between is my latest book, although it came out a while ago now! Watch the trailer here (or below) to find out what inspired the book. I worked with Bonnie Fortune to produce book trailer. Opening in April of 2019, Lacy will have a retrospective at the San Francisco Museum of Modern Art, curated by Rudolph Frieling, Lucía Sanromán, and Dominic Willsdon. The central themes of my 2010 book were: using a scheme of networks to analyze Lacy’s multifaceted art; considering gendered, racialized bodies in terms of positionality and performance; and recognizing participation’s intertwining with reception. Lacy has shown an enduring commitment to using art in public to inform people about issues of common concern to affect policy. I suggest that the “spaces between” in her art provide openings that might be transformative for selves that are permeable and multiple. Diana Fuss noted in 1991: “The problem, of course, with the inside/outside rhetoric, if it remains undeconstructed, is that such polemics disguise the fact that most of us are both inside and outside at the same time.” We perform, moving between art and life, built space and human flesh. This “between-ness” creates tension, at once dynamic and troubling. To enact these relationships in reality, on the ground so to speak, is especially difficult given the separation from, indeed denial of, our bodies. Lacy’s art has embraced the body, deepened into spirit, and enhanced bodily wisdom with strategic, intelligent analyses of politics. Her international career has demonstrated the power, problems and possibilities of art between the spaces of our diverse lives, as she has attempted to create structures that might give shape to a non-sexist, multi-racial democracy.